For the past nine years, almost every week I've written a letter to my parishioners in the weekly bulletin. Today's is the last of those letters. As I write that salutation to you, “Dear Friends in Christ,” for the last time as your pastor, my heart is filled with wonder and with gratitude for the tenderness that Christ has shown towards me during these past thirteen years. In the communion of life that we have been given together, I have daily encountered the face of Christ; a face of tenderness, mercy, and charity. As I ponder all that Christ has given to me in our communion together, I realize again that there is nothing that Christ will not give to me. Over the past decade, I’ve tried to use this column to build up our communion. Through humor, through expressing the practical needs of parish life, through doctrinal teaching, through explanations concerning the Liturgy or the Scriptures, and through personal reflections on my life as your pastor, I have tried to use this column to strengthen our communion. I did so because I believe that at the very heart of parish life there must be a very deep and solid communion. Without this communion, we have very little. Experience has only confirmed this within me. In these last words to you as your pastor, I wish to convey something necessary and serious; a charge of sorts. Do everything possible to preserve the communion of life that God has given to you. Do nothing to weaken that communion. The Evil One tries to steal sheep from the Lord by sowing division. He does this in all sorts of ways. He draws some away from the life of the Sacraments. He draws others away from the sure and certain doctrines of the Church. He draws others away from the authority of the Church’s pastors—the Pope, the bishops, and the priests. The division that the Devil sows is not only accomplished through grand gestures, but most especially in subtle ways. He does it through gossip, through calumny, through envy, through cattiness, through resentments, through disobedience, through backbiting, through cynicism, and through a thousand other proven methods. Christ draws us continually into deeper communion with the Trinity and with His Body, the Church. Christ is always about the work of communion. He draws the people He loves together through the sacramental life of the Church, through the profession of the One Faith, and through the life of charity. I urge you to guard zealously the unity that Christ has given to you. Avoid all division. Adhere with all of your strength to the True Faith. Humbly devote yourselves to the Word of God and to the Sacraments. Be obedient to those who exercise authority in the Church. Do nothing and say nothing that would ever allow anyone to think that there was even an inch of distance between you and the Pope, the Bishops, and your priests. Be of one heart and mind. Flee from all division. Never speak ill of one another and never allow envy, cynicism, dissension, or rivalries to have a place among you. Let the whole world marvel at the love that you show towards one another. These words, I know, are a bit odd to have as a parting letter to you. But, Christ has given to you something truly beautiful. Something so beautiful is always disdainful to the Enemy. Thus, you should be on your guard. Whenever you feel yourself drawn towards division, know that this is the work of the Enemy. Instead, be drawn towards deeper communion. Be quick in forgiving. Be generous in kind speech. Be steadfast in Faith. Be patient in adversity. Be one in mind and heart with your shepherds. Be constant in prayer. Preserve the unity that Christ has given to you. In his great prayer to the Father, Christ prayed, “that all might be one.” When you live that oneness with each other in the communion of the Church, you are living the fulfillment of Christ’s prayer. How Do I Know If I Am Called To Be a Priest? Recently somebody asked me, "So when did you know that you were going to be a priest?" I've been asked that question a thousand times in my life. I always begin by saying that as young as seven, I thought about being a priest. In the following years, the thoughts of priesthood were accompanied by thoughts of being many other things too. But, I recall quite vividly sitting one day in the adoration chapel of my parish church when I was in Tenth Grade. It was fairly dark. There was a light that shone down from the top of the sanctuary arch and illumined the silver monstrance that rested upon the altar. Without any fanfare or extraordinary occurrence, I simply became convinced that I was going to be a priest. In fact, so overwhelming was this revelation that I soon got up and left the chapel as quickly as I could. I didn't get up to leave in order to avoid this calling, but rather because the thought was so moving that I actually just needed to get up and . . . move. Ten years later, in the months preceding my ordination to the priesthood, I was once again overwhelmed by the thought that Jesus might actually be calling me to give myself to be a priest. One of the things that really made me nervous was the part of the ordination rite where the man to be ordained prostrates himself on the ground. For me, this was the sign of laying everything down. It meant keeping nothing for myself. With increasing nervousness, I began an intense period of negotiation with the Lord. All I knew is that I wanted to lay down 99% of my life for him. I thought that was a fairly reasonable and generous offer on my part. I didn't even know what the 1% I wanted to keep was. I just felt like I wanted to hang on to something--anything--that would belong solely to me. "Why does He even need everything from me?" I would ask. I would think that there must be some way around the whole idea of laying down my whole life for Him. I was like a lawyer trying to draw up a contract with some small loophole. "On the day of my ordination I, David Barnes, will give to God everything I am and possess except for the following . . . ."
I recall sitting for long periods of time in the seminary chapel. As I looked at the tabernacle, I felt like I was sitting at the bargaining table with Christ. I thought that eventually I would make him an offer that he couldn't refuse. I mean, I'd be willing even to give 99.9%. I just wanted to hang on to something. Laying down on that floor was an image of dying completely to self. I was looking for something a little less total than death. Jesus, however, is not a negotiator. No matter what reasonable proposal I made, I could envision Jesus sitting across from me and smiling, as if to say, "No matter how long this goes on, I'm asking you to follow me completely." On one of those afternoons that I was sitting in the chapel, a priest came in and sat down next to me. He stayed for a while and prayed next to me. As he got up to leave, he turned to me and said, "He wants it all, nothing less." Then, he left. That was pretty cool! Today, sixteen years after I laid down on the floor of the Cathedral of the Holy Cross in Boston, I offered the morning Mass in the parish where I am presently assigned. The Gospel today was about Jesus asking Peter, "Do you love me?" and instructing Peter to "feed my sheep." At the end of that Gospel, Jesus tells Peter, "When you were younger you used to dress yourself and go where you wanted; but when you grow old, you will stretch out your hands and someone else will dress you and lead you where you do not want to go." The Gospel concludes with Jesus saying to Peter, "Follow me." This is Jesus' negotiation proposal: "Follow me." It is the proposal he made to Peter by the Sea of Galilee. It is the proposal he made to me in the adoration chapel of Sacred Heart Church, North Quincy. "Follow me." It is the proposal he made to me in the seminary. It is the proposal he makes when I fail him and betray him. It is the proposal he makes when I am successful. It is the proposal he makes when I want to keep something for myself. It is the proposal he makes when I have had to endure suffering for his sake. It is the proposal he makes when I am the beneficiary of the kindness of others. "Follow me." When I have failed to follow him, his proposal continues, "Follow me." At times, this "follow me," is maddening! Following him is not always just a romantic notion of walking with him along the Sea of Galilee. "Follow me," entails being united to him in his humiliations, suffering, and death. "Follow me to scourging. Follow me to the crowning of thorns. Follow me Golgotha. Follow me." But, this "follow me" is also an invitation to the resurrection. As St. Paul says, if we are united to him in a death like his, so too shall we be united with him in a like resurrection. 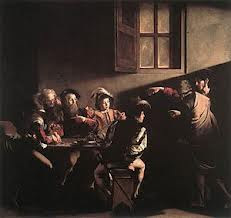 Maybe reading my blog today, there is some young man who is wondering if God is calling him to be a priest. Maybe you are holding off because you want some sort of great sign. Maybe you are hoping that if you wait long enough, Jesus might come down on his asking price! If you hear him saying to you, "Follow me," that's all you are getting. That's what Peter and Andrew, James and John got. That's what Matthew got. "Follow me." No matter how much you try to wear him down with counter-proposals, no matter how much you try to convince him of your sinfulness and unworthiness, no matter how you seek a different proposal, he is not backing down. If he says, "Follow me," that's the answer. He wants it all. How do you know if God is calling you? If you hear him say, "Follow me," and you get up and follow him, each day he will give you more and more clarity about your vocation. But, he's not going to meet your demands. The invitation to follow him means that you have to get up and follow. It is in the following itself that you gain certitude about your vocation. If you refuse to follow, you won't gain surety. You will know by actually following. "If we let Christ enter fully into our lives, if we open ourselves totally to him, are we not afraid that He might take something away from us? Are we not perhaps afraid to give up something significant, something unique, something that makes life so beautiful? Do we not then risk ending up diminished and deprived of our freedom? And once again the Pope said: No! If we let Christ into our lives, we lose nothing, nothing, absolutely nothing of what makes life free, beautiful and great. No! Only in this friendship are the doors of life opened wide. Only in this friendship is the great potential of human existence truly revealed. Only in this friendship do we experience beauty and liberation. And so, today, with great strength and great conviction, on the basis of long personal experience of life, I say to you, dear young people: Do not be afraid of Christ! He takes nothing away, and he gives you everything. When we give ourselves to him, we receive a hundredfold in return. Yes, open, open wide the doors to Christ – and you will find true life. Amen." Today, on the sixteenth anniversary of my ordination, I want to echo Pope Benedict and Blessed John Paul II. If you are a young man who has heard the voice of Christ saying, "Follow me," do not be afraid to do so. In laying down your life--hard as it is at times--you will find true life. In the midst of packing boxes as the date of my transfer approaches, I've been touched by the many gifts, dinners, and offers of assistance that have come my way. All of these gestures of tenderness and charity have shown forth for me the true face of the Church. In the communio of the Church we discover the face of Christ. Where this communio is lacking, the face of Christ becomes obscured. Programs, strategies, and bureaucratic structures can supplement the communio, but they can never replace it. And, when those things become ends in themselves and not at the service of the communio, the work of evangelization suffers. I believe Pope Francis said something like this recently when speaking about the Vatican Bank. In the Gospel Jesus says, "By this all men will know that you are my disciples, if you have love for one another" (Jn 13:35). In recent weeks, as I have pondered my years as pastor, I've considered what were the strengths and weaknesses. What most struck me about these years together is that we have loved one another. Charity is the great mark of our time together. We have love for one another. It is this love that has drawn new people to the Church. It is this love that has drawn vocations to the priesthood. It is this love that has revealed the beautiful face of Christ. Among the surprising and joyful aspects of this moment in my life is the amount of people who have included in their gifts to me, beautiful testimonies of their experience. There have been testimonies of people who were far away from the Church, from the sacraments, and from the Lord who discovered in our community the beautiful face of the Redeemer. In our love for one another, they were drawn back to Christ. Others, who perhaps were not far away from the Lord, nonetheless, have given testimony of their growth in the life of Faith. When we love one another, people know that we are Jesus' disciples and they are drawn towards this love. As the pastor here, I too bear witness to this experience. I too have encountered the beautiful and merciful face of Christ in the great love that marks our life together. This love has helped me to be a better priest. I want to share with you one way that this has happened. There is no denying the fact that the culture and the Gospel have arrived at an enormous divergence, especially in the realm of morality. In many ways, most people are more shaped by the views of the culture than they are by the Gospel. This places the preacher in a precarious position. There are two temptations that can seduce the preacher. The first is to tread lightly around any teaching of the Church that conflicts with the culture. The second temptation is to come out with both guns blazing and make it an all out battle. Without a communio of love, these are the preacher's only options. Both options are lies. The first hides the truth of the Gospel in order to preserve a false peace. The second says true things but only drives people farther away from those truths. But, my experience has been completely different. Love softens the blow. When the people know that their priest loves them and when the priest knows that the people love him, there is a beautiful freedom to preach and to listen to the Gospel. When we are so convinced of our love for one another, there is no fear of preaching or listening to the Gospel. Love casts out fear. And the more the Gospel is preached and heard, the more we love one another. And the more we love one another, the more others know that we are his disciples. And the more that others know that we are his disciples, the more they want to be his disciples because they see how we love one another. And the more we love one another, the more the Gospel is preached and heard. And . . . . . . . . . . .
All of us are seeking the face of Christ. The mission of the Church is to reveal the face of Christ to others and this face is revealed when his disciples love one another. All of us need to see the face of Christ. I need to see this face every day so that I can have surety in my life and so I can follow him. When his face is obscured, we can have no confidence about life and its meaning. When Christians fail to love one another and when they attempt to substitute other things for love, they obscure Christ's face and no longer become effective witnesses. But, when we have love for one another, we reveal Christ's face and this face awakens in the heart a confidence that nothing else can give. For Christians, we must wake up every day and seek the face of Christ where we know it is to be discovered. Instead of becoming discouraged by where the face of Christ is not, we ought to draw strength and consolation in where it is discovered. From this encounter with the face of Christ, we become better agents of the New Evangelization because we live with the conviction of Christ's love. It is certainly a sorrow that Christ's face is obscured in many places, but that cannot become our focus. Our focus must always be upon contemplating the face of Christ where it is discovered in our true experience. This contemplation will make us able to bring his love to those places where his face is obscured. This is the only path of true evangelization. Each day, the heart of the Christian echoes the longing of the psalmist who writes, "Come', says my heart, 'seek his face; your face Lord do I seek. Do not hide your face from me" (Ps 27) In my experience in this assignment for the past 13 years (and especially over the past few months), the Lord has answered this cry of my heart. The revelation of his face, manifested in the love of his disciples, is "my life's refuge; of whom should I be afraid?" (Ps 27). Only in the tender gaze of Christ does our heart discover peace. The disciples of Christ are at our best when we love one another and reveal this face, and we are at our worst when we obscure this face. I am grateful in these days that the tenderness of his mercy is made known to me in the love that his disciples have for one another.